Jimmy Douglas Davis, 1027 Manustown Rd., Woodbury, was served a Violation of Probation warrant on April 23. Davis was convicted in Cannon County Circuit Court on March 9 of Manufacture of Methamphetamine over .5 grams and of Theft Over $1,000. He was placed on Community Corrections for 12 years. Davis allegedly violated probation by failing a drug screen on April 3 for Amphetamines and Methamphetamine. Davis signed a voluntary admission on April 3 admitting to using Methamphetamine within the previous 10 days. Bond was set at $75,000. Initial court date is May 24. • Scotty Glenn Grizzle, 406 Todd Rd., Woodbury, was charged with Driving While License Suspended 3rd Offense and Violation of Probation on April 23 by Cannon County Sheriff’s Deputy Eric Moss. Deputy Moss was on patrol on Short Mountain Rd. on that date when he observed Grizzle driving a white Ford truck. Being aware there was a warrant for Grizzle’s arrest, Deputy Moss stopped the vehicle at the intersection of Short Mountain Rd. and Center Hill Rd. The VOP charge stems from a conviction for Driving While License Suspended 1st Offense on Feb. 21, 2012. Grizzle has allegedly violated probation by failing to report to his probation officer, failing to submit to random drug screens and failing to pay court costs, fines and supervision fees. Total bond was set at $5,500. Initial court date is May 1. • Devon Gunter, 321 McMinnville Hwy., Woodbury, was served a Violation of Probation warrant on April 21. Gunter was convicted of Driving While License Suspended 1st Offense on Dec. 27, 2011 and was placed on probation until June 26, 2012. He allegedly violated probation by testing positive for cocaine, marijuana, benzodiazepines and amphetamines on March 7. He has also failed to pay court costs, fines and fees as directed. Gunter tested positive for drug use in General Sessions Court on April 24 and was remanded to the custody of the sheriff’s department. His next court date was set for May 29. • Lynika Luchaina Bennett, 354 Sunny Slope Rd., Woodbury, was charged with No Driver’s License by Woodbury Patrolman John Fesmire on April 20. A release citation was issued. Initial court date is June 19. • Terry James Rosenbaum, 23 Melton Hollow Rd., Woodbury, was charged with Driving While License Suspended on April 20 by Woodbury Patrolman John Fesmire. A release citation was issued. Initial court date is June 19. • Diane Wilson Berninger, Ider, AL, was charged with Driver While License Expired by Woodbury Patrolman Chris Brown on April 22 following a traffic stop on Gassaway Rd. A release citation was issued. Initial court date is June 12. • Rodolfo L. Rodriguez, 2370 Hollow Springs Rd., Woodbury, was charged with Driving While License Suspended by Woodbury Patrolman Chris Brown on April 22 following a traffic stop on Sunny Slope Rd. A release citation was issued. Initial court date is June 12. • Donald Jacob Burnsworth, 8136 Cooper Dr., Murfreesboro, was charged with Driving While License Suspended 3rd Offense on April 19 by Cannon County Sheriff’s Deputy Steve McMillen. Deputy McMillen observed Burnsworth allegedly run a stop sign at the intersection of Hwy. 99 and Bradyville Rd. Bond was set at $1,000. A release citation was issued for the stop sign offense. Initial court date is June 5. • Michael J. Sanders, 200 Gin Ally, Alexandria, was served a Violation of Probation warrant on April 24. 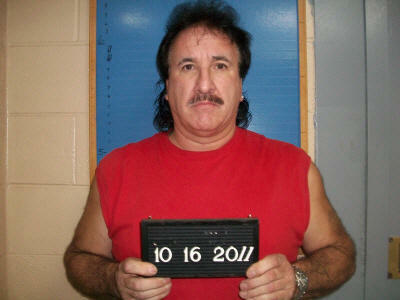 Sanders was convicted of Driving While License Revoked on July 9, 2010. He has allegedly violated probation by failing to report to his probation officer, failing to pay all courts costs, fines, supervision fees and restitution and has failed to serve his court ordered jail sentence. Sanders was ordered to serve 96 hours and never reported to serve his time. Bond was set at $30,000. Initial court date is May 24. • Sherry Smith Stephens, 211 Hayes St., Woodbury, was charged with Driving While License Suspended 4th Offense, violation of the Financial Responsibility law and violation of the Registration law on April 19 by Woodbury Police Sgt. Lowell Womack following a traffic incident on Bryant Lane. Bond was set at $8,000. Initial court date is May 8. • Jeremy Dwayne Vanatta, 206 Ligon Dr., Lebanon, was charged with Driving While License Suspended 3rd Offense by Woodbury Patrolman John House following a traffic stop on E. Main St. on April 19. Bond was set at $2,500. Initial court date is May 15. • Jeffrey Darnell Hedgepath Jr., 534 General Bragg Dr., Beechgrove, was charged with Driving While License Revoked by Woodbury Patrolman John House on April 18 following a traffic stop for loud music on W. Main St. A release citation was issued. Initial court date is June 19.